The recent development of English language teaching has proposed the Communicative Approach. This approach in some degree has replaced the use of the grammatical approach as the classical one. The grammatical approach was seen as failing to interconnect between psychological competence; grammatical competence, and social competence; discourse and strategic competence. Thus, the searching for an approach that accommodates the goal has arrived at the recent approach namely communicative approach. The proponents of this approach tend to see the goal of language teaching is not the grammatical competence, rather the communicative competence, the competence facilitated by a strategy, later called as strategic competence, allows someone to use every language potential inside his/herself for achieving a meaningful and successful communication. 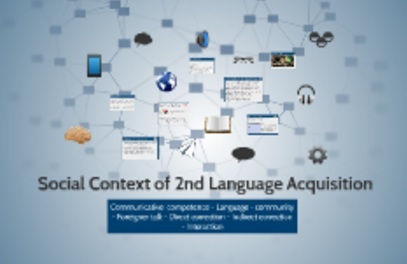 The communicative approach is originally based on the Sociolinguists’ view on Second Language Acquisition. Sociologists tend to view that language is acquired through the medium of input and interaction. Furthermore, the input and interaction are modified in some cases, such as when the competence of a speaker is in different level with the hearer. Those modification occures in order to gain a succesful communication. Accordingly, social environment where the interaction takes place has a significant role in the process of acquisition. Thus, the core of communicative teaching lies on the process of interaction is social life. How do sociolinguists view second language acquisition? What is the implementation of the view on English teaching field? What is the strength and the weakness of the view? Further discussions below will examine communicative competence and aspects surrounding it in more detail. It includes the discussions about models of communicative competence, aspects of SLA which is seen from sociolinguistics perspective, and the implication of the view on English teaching field. Instead of seeing the competence as a static knowledge, the proponents of communicative approach believe that “competence” covers both the static knowledge and the active use of the knowledge. In addition, the term competence is also accompanied with the notion of communication. Thus, it is necessary to define the notion of communicative competence in a comprehensible definition. Accordingly, some models of communicative competence has been proposed in order to meet the comprehensible definition. The model which will be presented here is the model proposed by Canale & Swain (1980). Discourse competence – the ability to combine language sturctures into different types of cohesive texts (e.g., political speech, poetry). Input and Interaction The process of acquisition is influenced by some aspects such as language input and interaction. Language input is considered as primary “data” for essentially linguistic and/or cognitive process. In other words, it is the source of data which in turn is further processed in the interaction to gain more advanced knowledge. Furthermore, interaction is generally seen as essential in providing learners with quantity and quality of external linguistic input which is required for internal processing. Therefore, language input and interaction play important roles in the process of acquisition. The goal of communicative competence lies on the gaining communicative competence, which has been explained earlier. The process of teaching and learning in the classroom also concerns with activities facilitated by the modification of input and interaction. Moreover, The teacher is actively involved in the activities, and becomes the facilitator and motivator, while students are expected to be comfortable with their peer. Therefore, the activities tend to be in the form of classroom or pair discussion. Fluency activities: one of the goals of CLT is to develop fluency in language use rather than accuracy. Mechanical, meaningful, and communicative practice: language practices that moves from controlled ones to free ones. Information-gap activities: it refers to the fact that in real communication people normally communicate in order to get information they do not possess. This approach is not guided by strict rules as grammatical/linguistic approach. Thus, it allows learners to feel free in learning English. The implementation of this approach is potential to build learners’ sustainable learning. It is due to the fact that activities guided by this approach are flexible, fun, and more student centered. The implementation of this approach gives teachers more flexible roles in the classroom. Accordingly, teachers have a chance to modify teaching procedures in more interesting way. This approach fails to explain the learners’ mental development in a systematic way. The explanation of the variation occurs in learners’ achievement has inadequate support from empirical study. This approach fails to explain some autodidact learners who teach themselves without having an exposure of communication. in fact, there are a lot of learners who are successful in learning English without such kind of communicative exposure. The implementation of this approach is weak when it comes to young learner education.